The elite ship of the Erebus Consortium. This transformable ship makes for one of the most agile and punishing foes encountered. In Speed mode, the DARKWAVE matches Rip Rocket in everyway while leaving scanner-blinding Chaos Mines making this a dangerous craft to pursue. 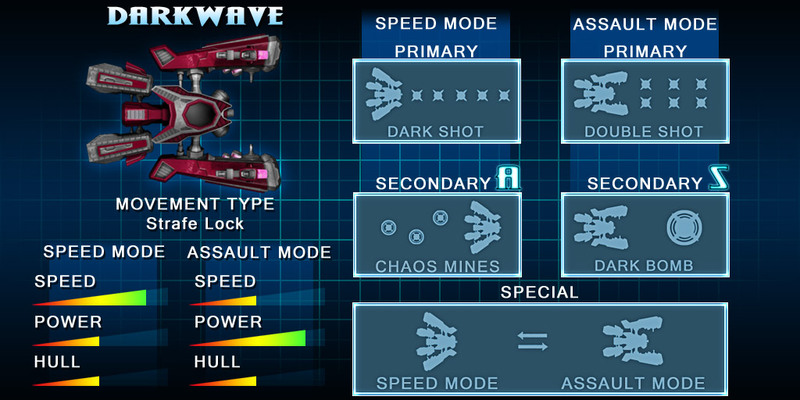 When transformed into Assault Mode, the DARKWAVE is a flying tank, shooting dual Dark Shots, charging Dark Bombs and laying down a serious wall of bullets while simultaneously strafe-dodging enemy fire!